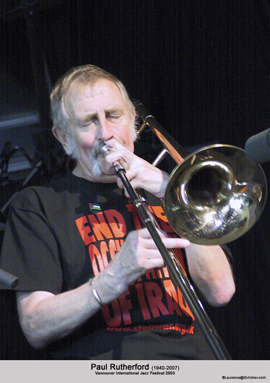 Paul Rutherford (1940-2007) was one of the founders of free music. A pure soul, he played many of his last gigs with bassist Torsten Müller touring in Canada and the USA. Misterioso invited Torsten, a compatriot and close friend of Paul’s, to compose this Homage. It was 1975. 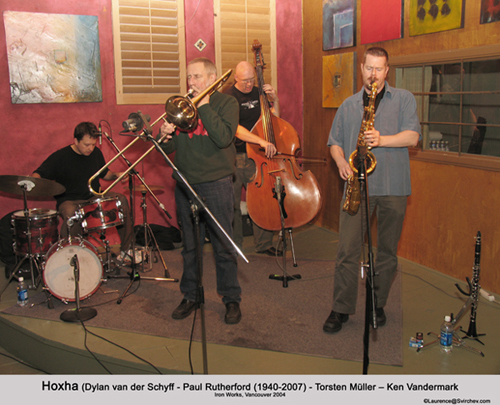 I was a teenager at my parent’s house on the lonely moors of Northern Germany, feverishly opening a package from FMP Records in Berlin, my lifeline to the world of free jazz and improvised music that I had recently discovered. The package contained one LP, Paul Rutherford’s Gentle Harm of the Bourgeoisie. I rushed to my room to put this object of desire, a record of solo trombone music, about which I had been speculating for weeks on the record player. What I heard was not just a man playing his music, it was a philosophy of playing that was to shape my musical perspective from then on. This was a music which contained within itself a dichotomy so stark as to seem almost incomprehensible. Quite obviously this was some of the technically most advanced trombone playing of the day yet here it was put to use to create a deeply soulful, anti-virtuosic statement that seemed to have more affinity to the joyousness of Kid Ory or the hauntings of Charlie Patton. He was a blues man, telling a story. Over the next few years I saw and heard him play several times in different contexts and I was always amazed at the depth and the endless levels of perception within his playing. Somehow he always seemed to shine differently than those players around him. For him, it was all about the playing. That was the essence, the naked music. He had no interest in banal concepts and fashionable projects designed to pique the interest of critics and promoters. This truthfulness to the music also held the seed of his own undoing. As the 60’s and 70’s waned, the socio-political importance that had been bestowed by critics upon this new form of music, was taken from it by the very same. Paul couldn’t understand that this music, which was the music of his own political utopia, had suddenly become a historical phenomenon, referred to by many critics that had championed it, and him, as outdated and obsolete. Other trombone players went on to carve successful careers for themselves by ridiculously inflating innovative aspects of trombone technique that had been pioneered by Paul into their own dog and pony show, most notably practitioners of endless multiphonic repetitiveness, circular breathing marathons, or just plain trombonistic psycho-drama. Paul, who had seen an abundance of work in those early years, was never able to adapt to the new world of concepts and projects, the world of the festival circuit. In fact, he never even understood it, so irreconcilable was it with his sense of musical and social justice. During the last few years he and I frequently toured the American and Canadian west coast, where he felt he had found something of a new home and new appreciation of his art. Occasionally a writer would ask him what projects he would still like to do or which musician he would like to work with. His answer was always the same, equally humble and plaintive, “I don’t care. I just want to play!” Paul Rutherford was a gentle and caring man, and one of the great musicians of our time. In time his legacy will become evident.